It seems like Easter came a few months ago, but that’s probably just because chocolate bunnies, creme eggs and hot cross buns have been on supermarket shelves since Christmas departed. Officially though, Easter is just around the corner, and we wish to advise all customers, suppliers and staff of Rotoplas holiday closure. Our office and factory will be closed for the Easter public holidays on Good Friday, 19th April and Easter Monday, 22nd April, and on ANZAC Day, Thursday 25th April. In addition to the public holidays we will also be closed on Friday, 26th April. We would like to wish all of our customers, suppliers and staff happy holidays, and would kindly ask our valued customers to be aware of Rotoplas holiday closure dates when placing orders. It is worthwhile to note that since Easter is so late this year, the three public holidays fall in the space of a week. This brings the likelihood of disruption to our production schedule and slightly longer lead times than usual. We apologise for the inconvenience and assure you that we remain committed to fulfilling your orders as soon as possible. Rotoplas trading hours will remain as normal outside of these dates. Although, if you have any questions outside of these hours, you’re more than welcome to submit them by contacting us here.Thank you for your support! 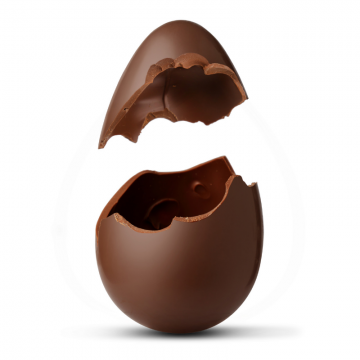 Just for fun: Did you know hollow chocolate eggs are one of the earliest known forms of moulding processes, used by the Swiss hundreds of years ago? Melted chocolate is introduced to the mould, which is rotated and cooled and the hollow egg removed. It’s a similar process to how our products are made! Although we don’t make Easter eggs, we do make a great range of great looking rainwater tanks and material handling trolleys. You can learn more about the rotational moulding process here.